With the profusion of waterways that run through Virginia Beach and feed into the Chesapeake Bay and Atlantic Ocean, there may be no better way to explore the beauty of our area than by floating right through it. Whether you’re in search of a physical challenge or you just want to spend a day floating around, there is no shortage of adventures to be had. Here are some of our favorite ways to get out and enjoy the water in Virginia Beach. 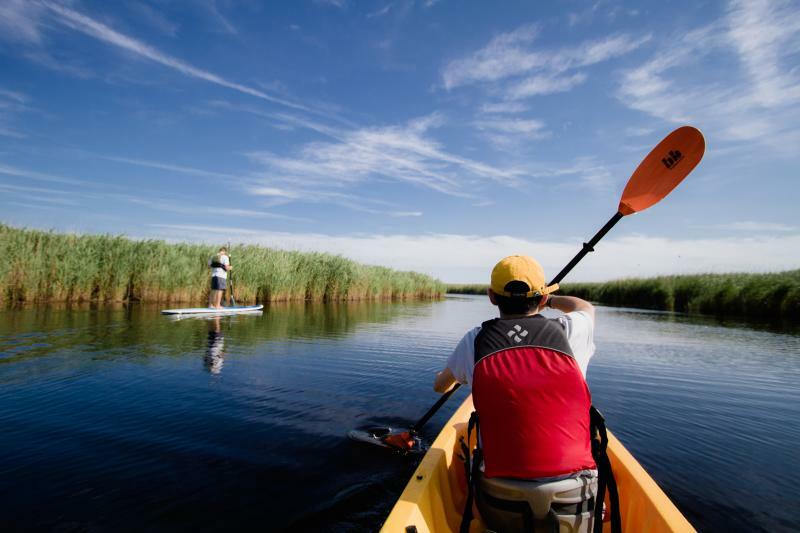 Hop aboard a stand-up paddle board (SUP) and explore one of the last great salt marsh habitats on the East Coast. Check out your equipment from a local outfitter, like Rudee Inlet Stand-up Paddle, and let the adventure begin. You can even take your yoga practice to the next level with SUP Barre on the water in First Landing State Park. The hour long session combines the rigorous full-body workout that you’d expect, with an added element of balance that can only come from standing on a board in the water. You’ll never want to go back to the gym again. If sitting down is more your speed, kayaking is one of our favorite ways to explore our waterways. 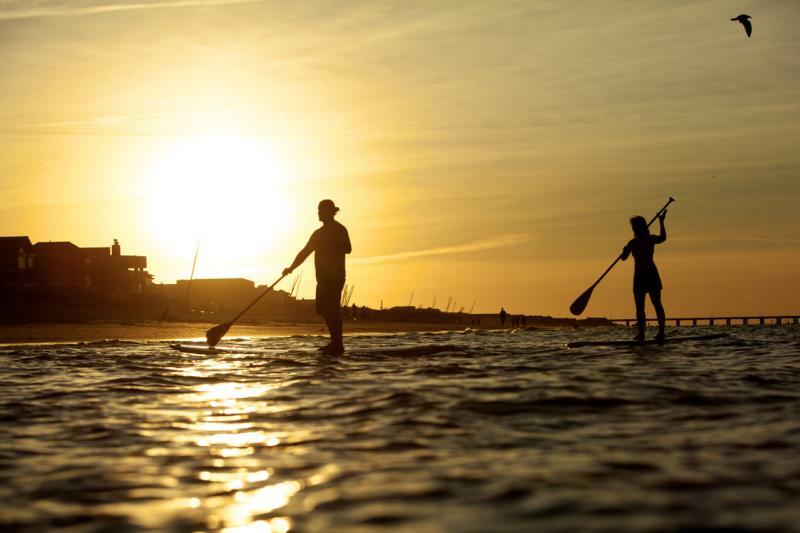 Whether you have your own or you opt to rent from a local outfitter like Surf and Adventure Company, in Sandbridge, it’s easy to get in a kayak and get going in Virginia Beach. There are few limits to where you can go or the wildlife you will see aboard these small maritime vessels. Dolphins are frequent visitors to the calmer inland waterways off of the Chesapeake Bay, and Tula Adventure Sports located in the Chesapeake Bay District, offers tours to kayak with these friendly animals. They even love to swim right up to you! For a tastier excursion, don’t miss Surf and Adventure Company’s Blue Pete’s Dinner Tour, for an unforgettable kayaking experience. The tour takes you through the enchanting Spanish moss-adorned bald cypress trees of the Back Bay Wildlife Refuge to Blue Pete’s, a popular Pungo staple since 1972, for a an unbeatable seafood dinner. Surf and Adventure provides all of the equipment so all you have to do is show up and hop in. If your idea of a fun day on the water is hanging out with your friends and family while literally being on top of the water, a pontoon boat is perfect for you. If you’ve never driven a boat before, Bay Venture Boat Rentals makes it easy with a quick seafaring training session, and easy-to-guide boats.The gentle water of Linkhorn Bay and Broad Bay make for an easy ride for beginning boaters so all you will need to worry about is relaxing in style. These boats even have the power to pull a wakeboard or inner tube to take your day up a notch. No boating license is required. Considered by many to be the birthplace of East Coast surfing, the spirit of surfing runs deep in Virginia Beach. Whether you’re a novice, a “grommet” or a seasoned pro, catching one of our swells is a local experience you need to try. Depending on the season, scoping out the ideal surfing conditions in Virginia Beach has become an art form. As many of our resident wave-riders will tell you, riding the perfect wave here comes at the cost of patience, tenacity and a little bit of luck – and that’s just how we like it. For those hopping on a board for the first time, Virginia Beach often offers the right conditions to safely ease into the action. If you are serious about honing your craft, many lessons and camps are offered at the Oceanfront and in Sandbridge, which will help you dive into what it takes to ride that East Coast wave. Local surf shops like Pungo Board House and VB Surf Sessions offer everything you need, from equipment rentals to surfing lessons and camps, that will have you upright and in the water in no time. For a completely new perspective, and spectacular views of the Virginia Beach Oceanfront, Rudee Inlet is the take-off point for several parasailing tours like Adventure Parasail, Pirate Parasail, and Air America Parasail. 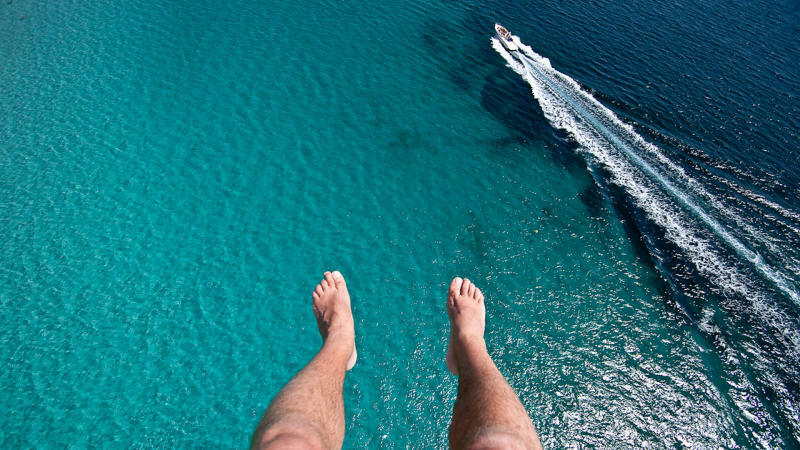 If you haven’t experienced the serenity that comes with floating 1,000 feet about the water, we think you should give it a try. Lynnhaven oysters, once coveted around the world for their size and saltiness, were near extinction just 12 years ago. Thanks to habitat revitalization efforts—an effort the folks at Pleasure House Oysters helped spearhead—the river’s oyster population is thriving. 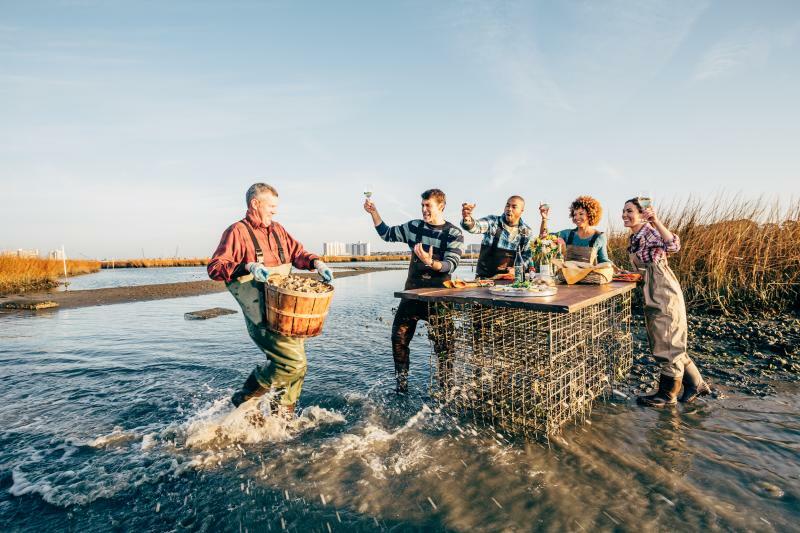 You can hop aboard a tour where you’ll learn more about that success story and the important role oysters play in the river’s ecosystem and you can even taste the oysters plucked straight from the water beneath you. The tour captain, Chris Ludford, wanted to give locals and visitors the opportunity to learn and experience what goes into growing and farming oysters, as well as teaching the importance and impact that they have on keeping the waterways clean. On his tours, you’ll learn about the history of the river that you just can’t find in history books. Since Chris’s farm is run solely by him and a few helpers, you can see the pure muscle that makes these legends come to life and land on the plates of oyster lovers from around the East Coast. The Virginia Aquarium offers probably one of the easiest ways to enjoy the water with their Craft Brews Cruise. 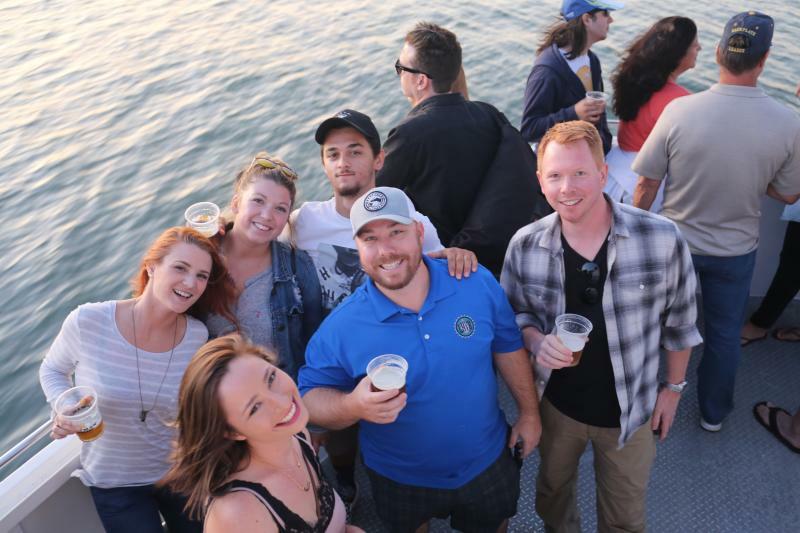 The aquarium has partnered up with many of our favorite local and regional breweries for an unforgettable, and decidedly local, experience. The tour, aboard the aquarium’s Atlantic Explorer is two hours in length and recurs monthly on the third Friday. Tickets can go quickly so make sure to reserve your spot in advance!